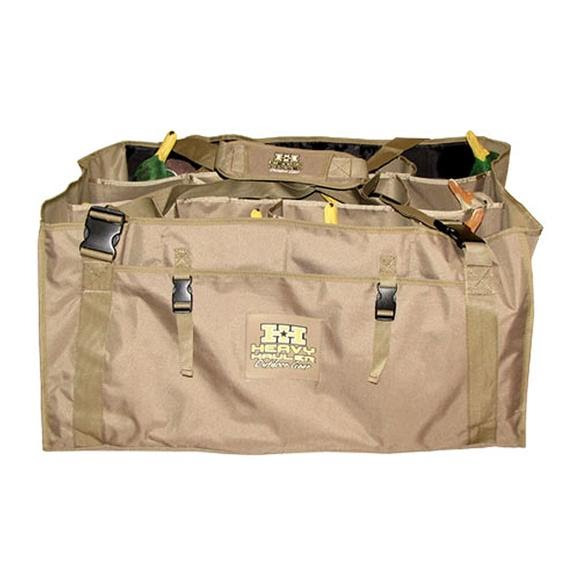 No more long, narrow, cumbersome decoy bags, here is the 3x4 configuration 12 slot duck decoy bag from Heavy Hauler. With a more uniform square shaped profile you can now better carry and more easily stack your bagged decoys. The bag is constructed of heavy duty 600 denier polyester with rubber coated mesh drain panels in the bottom. No more long, narrow, cumbersome decoy bags, here is the 3x4 configuration 12 slot duck decoy bag from Heavy Hauler. With a more uniform square shaped profile you can now better carry and more easily stack your bagged decoys. The bag is constructed of heavy duty 600 denier polyester with rubber coated mesh drain panels in the bottom. Adjustable, padded, shoulder strap with heavy duty temperature resistant buckles. Fits large floating or field duck decoys.